It’s been a tough decade for volcano tourism in Costa Rica. Arenal, Poás (partially re-opened), Turrialba, Chato, Tenorio (re-opened! ), Miravalles (re-opened! ), Rincón, Von Seebach, and Santa Maria Volcanoes have all been impacted by increases or decreases in volcanic activity, weather, earthquakes and even bureaucracy. On the positive side the increase in gas venting, rock and ash ejection and even lava activity closing visitor centers, access roads and hiking trails also creates a dramatic backdrop for nearby attractions that remain open. There are also a few volcanoes where access remains unaffected (see below). Tenorio Volcano & Rio Celeste Re-Opened January 2018 – Tenorio National park and most notably the trail to the Celeste Waterfall were closed briefly on January 12, 2018 after a “swarm” of seismic events (several small localized earthquakes within a few hours). During the shakeup the famous waterfall turned a muddy brown and there was online hysteria predicting the attraction was forever altered but it seemed more likely to us that it was just mud from small quake triggered upstream landslides. The park re-opened two days later and the river and Celeste waterfall regained their eponymous coloration. Chato – OFF LIMITS 2017 – Cerro Chato has been inactive for thousands of years. The clear cold lake in the bottom of the crater and the spectacular views of Arenal a mere mile north from the rim made this the most popular volcano hike in Costa Rica. Unfortunately the trail was declared off limits in February of 2017 because guides were using it to stage climbs up the back side of Arenal. We’ve been told that there is insufficient manpower to enforce the Lago Chato closure. Only the official guided hikes are being cancelled and many people are ignoring the ban and hiking anyway. Miravalles – Re-Opened May 2017 – the trails from the outskirts of Bijagua to the waterfalls in Miravalles National Park were wiped out by Hurricane Otto in November 2016 but have been re-built and are open as of May 2017 – Yipee! Poás – Partially Re-Opened August 31st, 2018 (see details) – Once the most visited volcano in Costa Rica the trails, it was closed indefinitely in April 2017 due to increased activity. Feb 14, 2019 7:00 a.m. CST – After a two day temporary closure due to ash and emission Poás Volcano National Park is open to visitors with reservations. Feb 11, 2019 7:00 a.m. CST – Poás is closed to visitors due to high levels of activity. The visitor’s center/museum, cafe, gift shop and trails through the cloud forest and to Laguna Botos remain closed but visitors are now allowed to walk up to the crater overlook accompanied by guides. 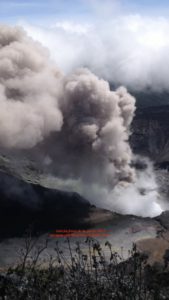 Turrialba – CLOSED 2015 – the most extensive and beautiful network of volcano trails in Costa Rica shut down in 2015 due to dangerous levels of activity in two of the craters. The road to the rim is also closed to the public. Earlier in the summer a drone confirmed what residents have been reporting – a lake of lava more than 150 feet across has formed in the west crater of Turrialba volcano. Locals have noted an orange glow reflecting off of nighttime clouds for several weeks. The surfacing magma ensures that the peak and crater trails will remain closed but some are hoping to draw tourists to the surrounding area for lava viewing. 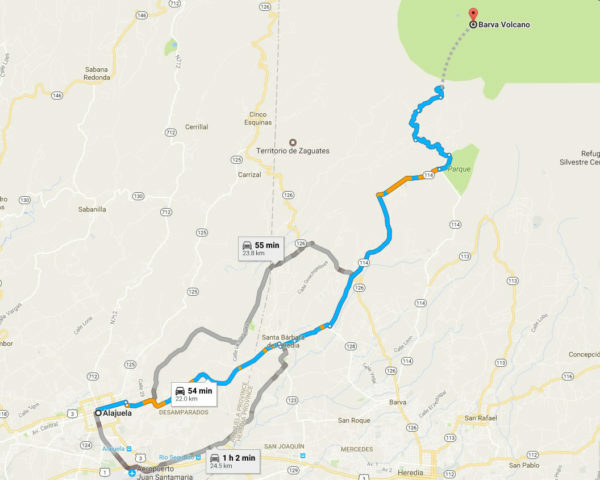 Rincón de la Vieja, Von Seebach, Santa Maria – OFF LIMITS 2014 – Starting sporadically in 2014 all three trails (north from Las Pailas, west from Santa Maria and south from Dos Rios) to all three craters were closed due to increased levels of activity in Rincón. Although the it’s been relatively quiet through 2018 the trails to the peaks are now closed permanently. 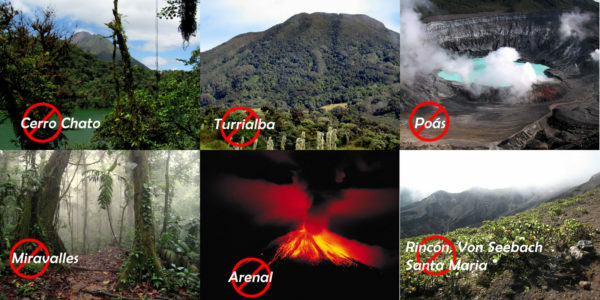 Arenal – DORMANT 2011 to 2018 – Arenal quit spewing lava in 2011 and although the beautiful cone still dominates the landscape there are currently no spectacular eruptions. UPDATE: October 2018 – It’s dangerous and illegal to climb Arenal – most recently four tourists were hospitalized (one with a serious compound fracture of the femur) when they were injured in an ash, lava rock and boulder slide while attempting to summit Arenal. A team of rescuers took two days to evacuate the climbers. Please do not be a moron. The zone around the crater is off-limits because of unstable slopes, poison gases and because it’s really expensive to rescue idiots who ignore the closure. SJO Juan Santamaría International Airport – INTERMITTENT CLOSURES – Increased activity at Turrialba has shut down Costa Rica’s main airport a few times for a couple of hours to a couple of days. Poás is even closer but so far the ash fall has been carried away from the airport by prevailing winds. NOTE: the status of trails and other amenities is subject to change without notice – use the directory of Costa Rican National Parks to contact the local offices for updates. At times Costa Rica has had three drive up volcanoes. Currently Poás and Irazú are open. Visits to Irazú tripled in 2017 after the closure of Poás and Turrialba. Although the colossus dominates the eastern skyline and appears close enough to touch from downtown San José it takes over an hour and a half to wind up the paved road past the famous cathedral and ruins in Cartago, bucolic hills, and finally elfin cloud forest before reaching Irazú’s summit. 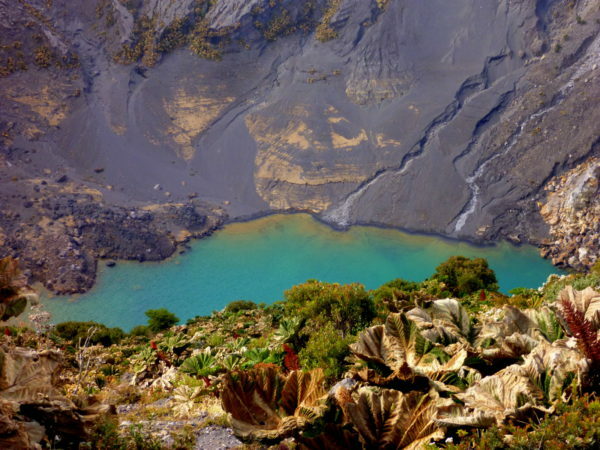 If you want to hike right up to a crater lake there are still a couple of trails open to Lago Barva (in Braulio Carrillo near San José) and Lago Danta (near Tenorio). It was frequently warm and sunny at Lago Chato where a refreshing swim in the crater lake was de rigueur after the long hot climb. Both Barva and Danta are at significantly higher elevations than Cerro Chato, much colder and surrounded by cloud forests rarely penetrated by the sun so swimming is not popular. Tenorio Volcano National Park has always been one of our favorites. Access to the top has always been limited and less than 1 in 5,000 visitors ever made the difficult climb preferring to hike to the amazing Celeste Waterfall and hot springs of the lower slopes instead. After a quick visit to the reopened crater there are other attractions on the slopes of Poás volcano. La Paz Waterfall Gardens, and the Doka and Britt Coffee plantations are open and considered premier attractions from San José and the central valley. A slight detour (and possibly some 4WD) to the east puts visitors on the trail head to the crater of Barva Volcano in Braulio Carrillo National Park. The closure of the trails to the triple summits of Rincón, Seebach and Santa Maria will probably go unnoticed by the vast majority of visitors most of whom would never attempt the long, steep and extremely challenging climb if it were open. 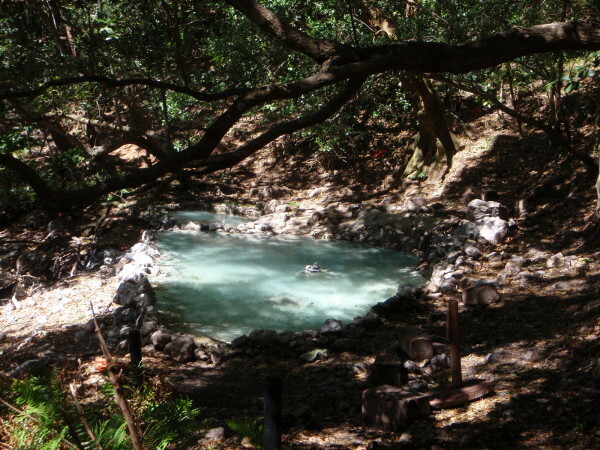 The closure has not impacted the trails to the waterfalls, back country hot springs and the nature walk around the geysers and boiling mud pots which all remain open. Additionally, the slot canyon white water tubing, ziplines, spas and other attractions outside the park are still some of the most popular day trips from the Guanacaste beaches. Although the spectacular night time displays stopped years ago, Arenal volcano still puts out enough heat to warm the hot springs and the region still attracts tourists with zip-lines, rafting and other adventure activities. In April of 2017 the national park was evacuated and closed indefinitely when the cooled lava dome in the crater collapsed and sent ash and rocks into the air during a period of higher than normal activity. The volcano activity has since decreased back to typical levels and a number of visitor safety features were added in order to partially re-open Poás National Park on August 31, 2018. Please see this link for ticket purchase instructions (required) and further information. August 28, 2018 – SINAC (Sistema Nacional de Áreas de Conservación) quietly informed tour operators that the work is complete and the national park will re-open soon. President Carlos Alvarado will preside over an inauguration ceremony for the new facilities on Wednesday August 29th and the park will reopen to the public on Friday August 31, 2018. The parking area, restrooms and overlook are re-opening. 50 visitors at a time will be permitted a total of 20 minutes at the rim accompanied by guides trained in safety measures. July 24, 2018 – The “last week of July” re-opening is cancelled and SINAC (Sistema Nacional de Áreas de Conservación) has not provided a new official estimate. June 2, 2018 – The SINAC (Sistema Nacional de Áreas de Conservación) June 1 estimate for reopening has passed and the new official estimate for partial re-opening is the last week of July 2018 and access to the full trail system by sometime in 2019 at the earliest. Construction on the shelters began last Monday and SINAC officials met again with Instituto Costarricense de Turismo (ICT), Ministerio de Ambiente y Energía (MINAE), Comisión Nacional de Emergencia (CNE), and Comité pro Apertura del Volcán Poás (CAVP) last week to begin the process of purchasing the required real time noxious gas monitors. April 28, 2018 – SINAC (Sistema Nacional de Áreas de Conservación) representatives stated that cleanup, some shelters and trail improvements are completed (see complete list of re-opening requirements below) and that hiring of guides and training (expected to take about a month) has begun. The new official estimate for partial re-opening is June and the trails and amenities are all expected to be open by the end of 2018. 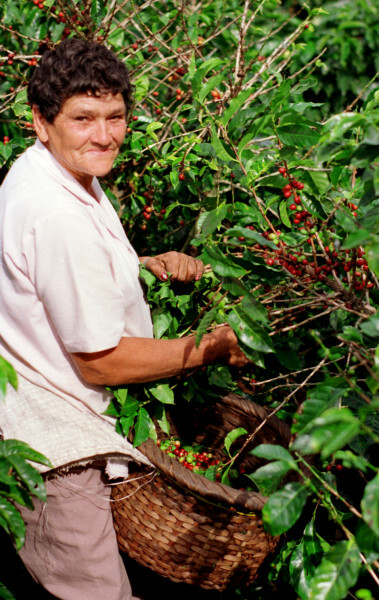 March 18, 2018 – SINAC (Sistema Nacional de Áreas de Conservación) representatives stated unequivocally that Poás will not open by Easter as rumored. The requirements and conditions announced on March 3, 2018 for the possible re-opening the National Park have not yet been implemented. The new official estimate is May or June. UPDATE January 26, 2018 The National Seismology Network has determined that the current mechanism of degasification makes it unlikely that there will be premonitory earthquakes which previously gave warning of impending eruptions. According to Lidier Esquivel at the National Emergency Commission the lack of seismological indicators means the park could not be evacuated in time and is the reason the park remains closed. Turrialba volcano national park was closed for similar reasons six years ago and has not reopened. December 26, 2017 – The local community petition to reopen Poás was rejected and the park remains closed until further notice. July 4, 2017 – Recent evidence of lava ejections from the “Boca Roja” (Red Mouth) crater at Poás volcano mean the temporary closure of the national park, museum and visitor’s center will continue indefinitely. When Arenal started spewing lava access was prohibited for 50 years. 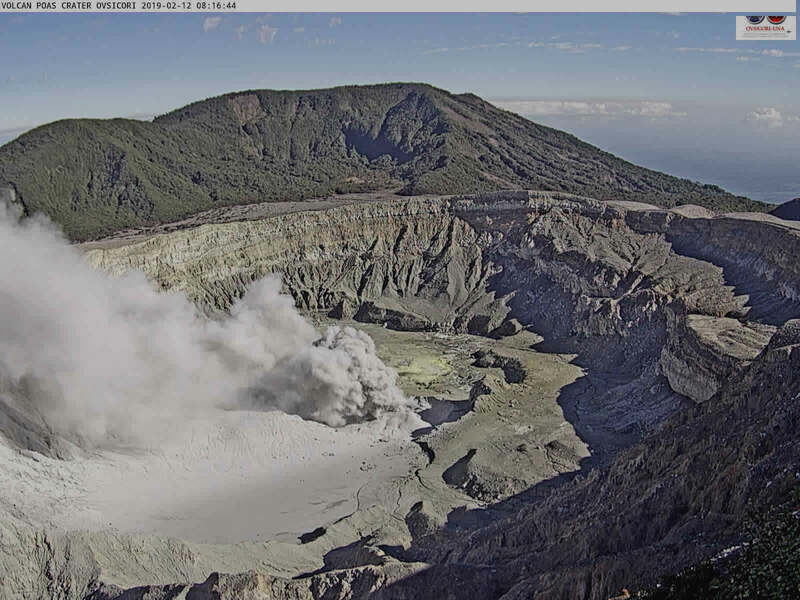 June 6 2017 – Another ash and steam eruption ensured that the park will remain closed so the best view you can get is from the OVSICORI live crater camera.